MUMBAI: In her canary-yellow sari and gold earrings, with a pair of thin-framed spectacles perched on her nose, Surekha Yadav could be any woman stepping down from the train at Mumbai's main railway station. 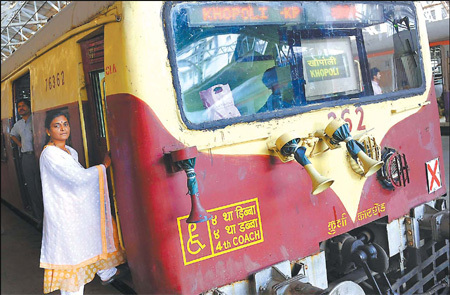 But the 44-year-old mother-of-two stands out from the crowds on the platforms at the Chhatrapati Shivaji Terminus (CST) as she doesn't just travel on the trains - she drives them. Yadav was the first female passenger train driver on Mumbai's Central Railways and has become a standard-bearer for women in a traditionally male-dominated industry. Since she first jumped into the cab of Mumbai's packed commuter trains 10 years ago - attracting curious looks from commuters - one other "motorwoman" now plies the same suburban route. Two are assistant drivers. There are also women train drivers on the Western Railway network, ferrying many of the 6 million people who use the city's overstretched network every day. Yadav, who admitted having no interest in trains before applying for a job as an assistant goods train driver in 1989, said she has had nothing but support from her male colleagues. "They encouraged, helped and took care of me," she said, adding she had taken special training to become the first woman driver of a "ghat loco", the two-engined passenger trains that climb the hills of western Maharashtra state. "Because I was the only woman, they were curious whether I could do it or not," she said. Women like Yadav can be found throughout Indian history, from warrior queens like Rani Lakshmibai and members of the independence movement to the first - and so far, only - female prime minister, Indira Gandhi. But although India's constitution "guarantees to all Indian women equality", differences between the sexes still exist, particularly in rural areas, in terms of access to education, health care and even food. Over a third of Indian women aged 15 to 49 said they had experienced domestic violence, according to a 2007 National Family Health Survey. Overall violence against women increased by nearly 25 percent between 2003 and 2007, the latest available government statistics show. The highest rises - more than 30 percent - were recorded for kidnap, abduction and torture. Madhu Purnima Kishwar, of New Delhi's Centre for the Study of Developing Societies and founder of leading rights group Manushi Sangathan, said that in the workplace gender was no bar to success - provided women were strong. "In India, women who demonstrate that they are stronger than men usually find men falling at their feet," she said, linking it to the worship of Hindu goddesses and the importance of mothers in Indian society. Apart from being India's first "motorwoman", Yadav has also been part of the attempt to curb another problem: complaints about sexual harassment - or "eve-teasing" as it is known in India. Rail minister Mamata Banerjee introduced "Ladies Specials" trains in India's four largest cities this year to improve safety for female commuters, whose numbers are increasing as more urban women forge careers outside the home. Yadav drove the first service into CST. She is positive about her job and the opportunities it has given her, attributing her determination to succeed to her family, who sent her to convent school before she took a diploma in electrical engineering. "Everybody was given the chance to chase their own dream. Whatever they wanted to do. We had freedom for education. We took advantage of that. We were very lucky to get that," she explained. "(My mother) never said being a girl child you should do cooking. You should study first then we will see. You need to be bold." Nevertheless, Yadav - who cites as influences Indira Gandhi and Lakshmibai, the 19th century heroine of Indian resistance against the British - admits it has still been tough. The job is physically demanding and time consuming, giving her less time to spend with her two teenaged sons and police officer husband. Working in an all-male environment since college has also taken its toll on her social life, she said. "I miss the friendship with women for the last 23 years. I feel shy talking with girls now," she said. The Afghan war will come to its 10 years old in 2010 since it began in 2001. What is its result?